The first one on Miles Kane pedalboard. Sold for charity on Moby's official Reverb shop. In this video, Mike is explaining how he creates some of the loops and beats for Linkin Park's songs. At :18s he plays the original loop which he has running through a [Hog](http://equipboard.com/items/electro-harmonix-hog), [Stereo Polyphase](http://equipboard.com/items/stereo-polyphase-electro-harmonix), Holy Stain, and [Memory Man](http://equipboard.com/items/electro-harmonix-stereo-memory-man-with-hazarai). 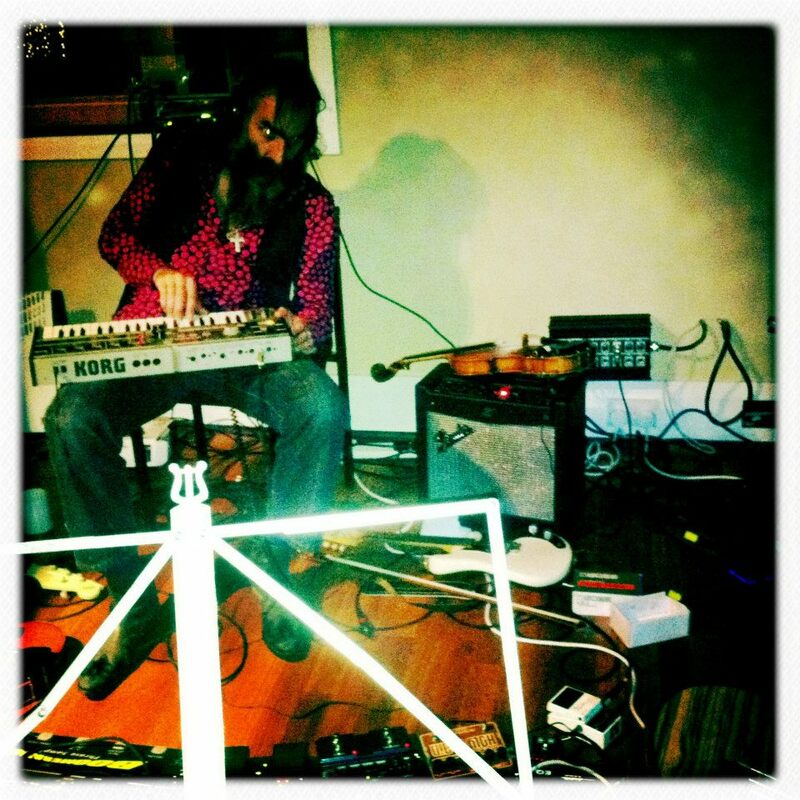 Warren can be seen here with the Holy Stain while playing his MicroKorg. If you look on the Mixer you will see the Holystain. The Holy Stain only brings righteous possibilities that emerge when you combine a kaleidoscope of effects: Reverbs, Pitch Shifting, Tremolo, pure analog drive and fuzz. The brilliance of the Stain lies in the dynamic interaction of its controls. Invent brilliant tonal combinations much like Ulver. To the left of the top KFK EQ pedal is the Holy Stain pedal, as characterised by the massive lettering as well as the EHX logo on the bottom of the pedal. The Holy Stain can be seen on this pedalboard, right below the powercord. At the 0:10 mark, you can see all the pedals that Kool Breeze uses. The Holy Stain can be seen 0:15 into this video. 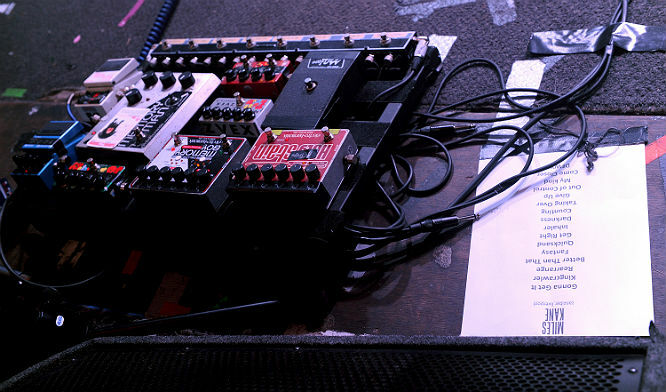 The Pedal can be seen on Sergio pedalboard on the reckless recording sessions. This pedal is kind weird but if you give it the chance, it would not betray you. Very good pedal, I use it as a Booster, distortion, reverb, and pitch. The full "newbie's" pedal row, for the price of one. Tasty EHX fuzz isn't exactly Muff, but it's good enuff. Only disadvantage is you don't have v' much control over the standard FX' parameters, the distortion & tone-colour only have three selectable presets each, and the pitch shift is more of a detune than something like, say, the Pitch-Fork (also by EHX) or the Boss Super Octave. Lovely trem tho, almost comes close to a couple Hofner trems I've used, and that's saying something for a tremolo included as part of a friggin' multi-FX whose focus is mainly on dist and reverb. Needs a way to blend the color and dirt signal but gives me a lot of interesting options. I like keeping it around to experiment with. pude comparar esse pedal ao EHX cathedral. São reverbs diferentes mesmo em modo similar (hall e room) porém a qualidade é incontestável, é um efeito extremamente útil em ambiências e gravações. o pitch shifter pra mim nao tem muito uso, porém o tremolo é muito bom para efeitos mais radicais e os drives são muito uteis, principalmente com algum pedal antes como boost de ganho. no meu board ele é o coringa, que pode fazer várias funções que podem faltar em gravação ou ao vivo. Em cada banda e projeto posso setar um modo diferente. Ele também serve como boost limpo, basta setar todos os efeitos no minimo e aumentar o volume. good multi effects if you want a lot of control and option in one box. I run it clean and on warm setting. trem and reverb can't be used simultaneously.